Markets shrugged off weak economic data last week and pushed the S&P 500 to an all-time high. The S&P climbed 0.3%. The Dow Jones Industrial Average rose 0.5%. And, the Nasdaq jumped nearly 1%. Heading into 2015, one of the few things financial experts agreed on was that volatility would pick up throughout 2015. So far, they have been correct. A broadly cited measure of volatility is the Chicago Board Options Exchange’s Volatility Index, better known as the VIX. This has risen just slightly this year. Another way to measure volatility is to look at the number of days where indexes post a move greater than 1%. According to Ned Davis Research, since 1902 the Dow Jones Industrial Average makes these outsized moves about 23% of the time. 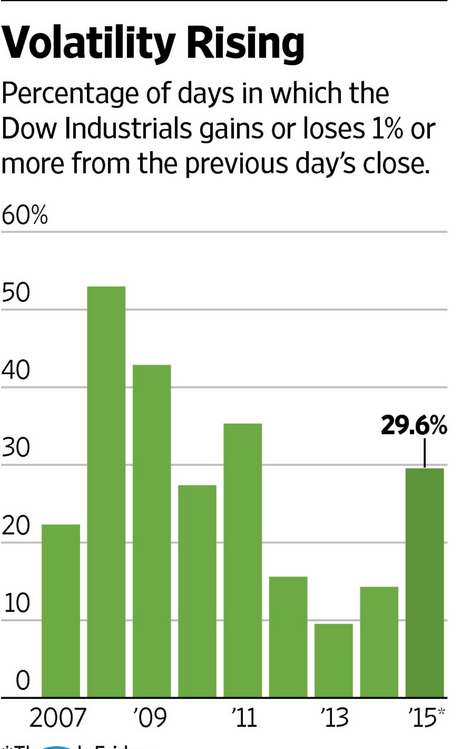 From 2012 to 2014, sharp one-day moves occurred at nearly half that rate, just 13% of trading days. So far this year, anxious investors have pushed the market 1% or more approximately 30% of the time. In an odd seasonal move, natural gas prices have pushed into bull territory after jumping more than 20% over the past few weeks. Late last week, futures rallied to over $3.00 per million BTUs. Traditionally, natural gas prices move lower as the weather warms since it is mostly used as a heating fuel. 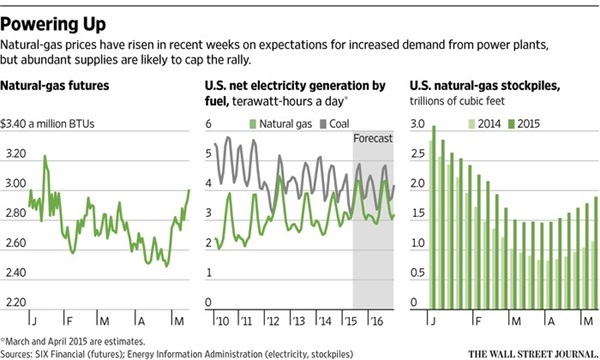 The recent rise is coming from an environmental regulatory change that is prompting utilities to retire coal-fired electricity plants. Most of this year’s closures will be shuttered in the next few weeks. That generation burden is being replaced by gas-fired plants, which is boosting demand and creating a smaller than anticipated rise in inventories. According to the U.S. Energy Information Administration, 111 billion cubic feet of natural gas was added to storage. This was short of expectations, but still 35% larger than five-year average for this time of year. Last week the Commerce Department reported flat retail sales for the month of April, well below the 0.3% increase expected by economist. Most expected Americans to splurge in April after the harsh winter weather and several months of squirreling away savings from lower gas prices. April marks the fourth time in the past five months where retail sales came in flat or down. Consumers did loosen the purse strings for certain items. Sales of sporting goods, health & personal care and building materials rose. So did restaurants, which is interestingly one of the few representatives of the service sector in the measure. Many expect spending to increase once lower gas prices are considered permanent, and history supports this. Even if you are not good at math, your nose is. A team of scientists from the National Center for Biological Sciences in India recently conducted a study to determine how exactly the brain determines smells. Odor arrives into the nose in tiny packets of molecules. Receptors inside the nose then produce a series of electrical signals that are transmitted to the brain. The strength and duration of these signals are then interpreted and translated into smells, very similar to Morse code translating beeps into letter. This is all fairly well known. What is interesting is the spacing and duration of those signals changes in a very predictable pattern depending on the strength of the odor and how long it lasts. Essentially, the nose is formulating very simple linear equations and sending them to the brain to solve. This may sound trivial, but nonlinear information is exponentially harder to solve. Anything that can be reduced to a linear equation can be decoded easier. This breakthrough could lead perhaps understanding processes in more complex organs, or even an artificial nose to sniff out bombs.